Retinal horizontal cells are very unique cells in many ways: They are the only inhibitory neuron type in the outer retina. They are post- but also presynaptic to photoreceptors thus providing inhibitory feedback and modulating photoreceptor output signals at the very first synapse of the visual system. Also, horizontal cells form a very large intensively electrically coupled network (Figure 1). 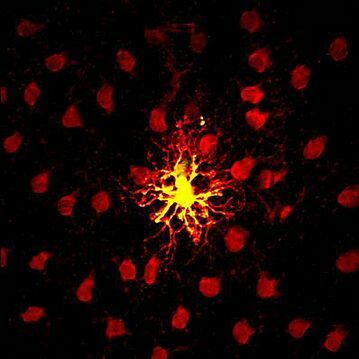 Horizontal cells and their complex synaptic connections in the outer retina are an almost perfect model system to study interneuron connectivity as well as chemical and electrical synaptic function. Additionally, in the last few years the horizontal cells have turned out to be a good model for studying developmental processes – with surprising results. 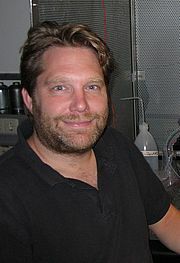 During my PhD thesis in the lab of Prof. Dr. Reto Weiler (University of Oldenburg, Germany) my scientific interest initially was focused on the identification of proteins forming electrical synapses between horizontal cells (Hombach et al., 2004) and on calcium signaling aspects in horizontal cells (Schubert et al., 2006). As a postdoc in Prof. Rachel O. Wong’s lab (University of Washington, Seattle, USA), I then turned towards the development of horizontal cells. I was particularly interested in the putative mechanisms of how horizontal cells establish their typical mosaic and how they make synaptic contacts with cone photoreceptors. In the developing retina, horizontal cell precursors migrate up vertically from the inner retina, find their destination positions in the outer retina and form the horizontal cell mosaic. Figure1: A single horizontal cell was injected with a fluorescent dye (AlexaFluor488) and the tracer Neurobiotin. AlexaFluor488 is non-permeable for electrical synapses and labels the dendritic tree of the injected horizontal cell (yellow). In contrast, Neurobiotin passes electrical synapses and reveals electrically-coupled neighboring horizontal cells (red). Figure 2: Ablation of two horizontal cells (white dot indicates ablation region) leads to extension of dendrites towards the ablated region 2 hours after the ablation in the early postnatal retina. Horizontal cells express GFP and are visualized with a 2-photon microscope. Horizontals cells around the ablated region are pseudo colorized to track dendrite outgrowth. 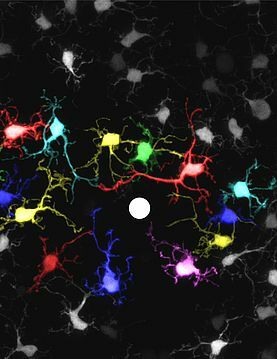 To gain more insight into how theses interneurons find their final position in the mosaic, we perfomed 2-Photon microscopy time-lapse experiments at embryonic and early postnatal days. Individual GFP-labeled horizontal in the living retina were ablated and the dendritic outgrowth of neighboring horizontal cells was observed over the next hours. Remarkably, dendrites of early postnatal horizontal cells very rarely overlapped but when one cell was ablated, the neighboring horizontal cells extended their dendrites into the ablated region (Figure 2). 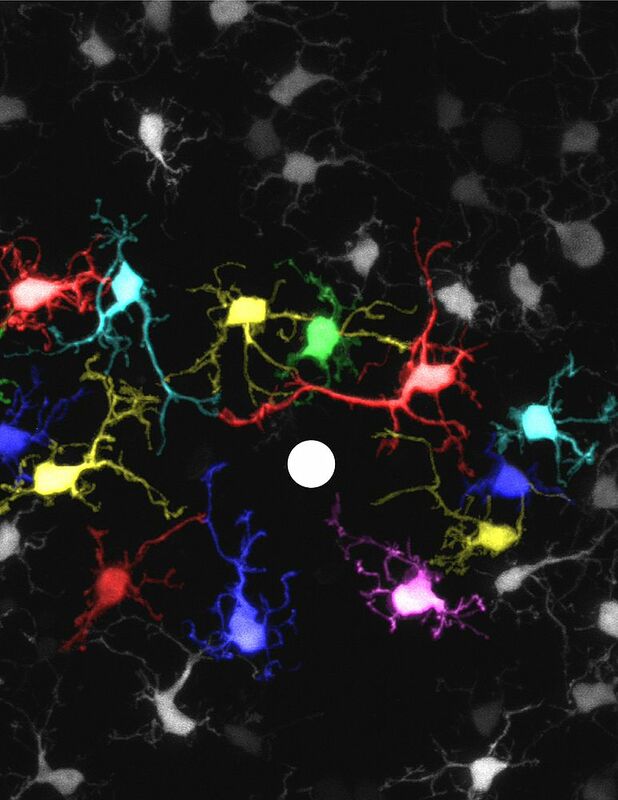 This observation points to transient homotypic repulsion among horizontal cell dendrites during early development as a possible mechanism of how these interneurons find their position in the mosaic (Huckfeldt et al., 2009). Curiously enough, homotypic repulsion of horizontal cell dendrites must disappear at later stages of development since horizontal cells in the adult retina are among those cells with the strongest overlap. Another key question for me has been whether GABAergic transmission of horizontal cells is essential for establishing synapses with cone photoreceptors. In a transgenic mouse line in which the synthesis of GABA in horizontal cells is selectively knocked down, we found the synaptic contacting area between cone photoreceptors and horizontal cells was increased whereas the overall connectivity has was not affected (Schubert et al., 2010). Thus, GABAergic neurotransmission during early development does not regulate the specificity of synaptic partners but apparently adjusts the contact at the photoreceptor synapse and therefore possibly the synaptic efficiency. Hombach S, Janssen-Bienhold U, Söhl G, Schubert T, Büssow H, Ott T, Weiler R, Willecke K (2004). Functional expression of connexin57 in horizontal cells of the mouse retina. Huckfeldt RM, Schubert T, Morgan JL, Godinho L, Di Cristo G, Huang ZJ, Wong RO (2009). Transient neurites of retinal horizontal cells exhibit columnar tiling via homotypic interactions. Schubert T, Weiler R, Feigenspan A (2006). Intracellular calcium is regulated by different pathways in horizontal cells of the mouse retina. Schubert T, Huckfeldt RM, Parker E, Campbell JE, Wong RO (2010). Assembly of the outer retina in the absence of GABA synthesis in horizontal cells.